On June 20, 2014 Fix The City, Save Hollywood, La Mirada, HELP and Attorneys for the City of Los Angeles once again stepped into Judge Allan Goodman’s Superior Court to deal with the now-defunct Hollywood Community Plan update. More specifically, FTC and its fellow community groups were there to challenge what the City did in response to being ordered by the Court to scrap the flawed plan. In February of this year the City was been soundly defeated by the above coalition of community groups when Judge Goodman ordered the City to rescind its new Hollywood Community Plan. The City did rescind the new plan and reenact the old plan. However, in the guise of complying with the Judge’s order, the City voted on April 2nd, 2014 to modify the General Plan Framework to make community plan monitoring and reporting discretionary. The City Council even went so far in the Resolution they adopted to deal with the stern admonition from the Court to state that the intent of their action was to “overrule and supersede” the writ and judgment of the Court. The judge was probably being very kind when he said that move was “too clever by half”. But Judge Goodman did not stop there. He stated that the Resolution the City adopted was demonstrably arbitrary, capricious and without basis in law, that no reasonable person could conclude that adoption of the April 2nd Resolution made the General Plan of the City of Los Angeles internally consistent but that the contrary was the case. Further he stated that the City’s actions constitute a misstatement and misapplication of the City Charter, state law and his February 11, 2014 Judgment. In court, the Judge was clear in pointing out, over and over, that CEQA requires monitoring and reporting. The City argued that monitoring and reporting were discretionary at both the General Plan level AND at the Community Plan level. The Judge, distinguishing this case from a previous case concerning infrastructure reports, pointed out that the previous case did not address State law (CEQA) requirements. He stated that since monitoring and reporting were required by CEQA, monitoring and reporting had to be mandatory somewhere. Why is the City Attorney fighting so hard to make monitoring and reporting discretionary instead of mandatory? 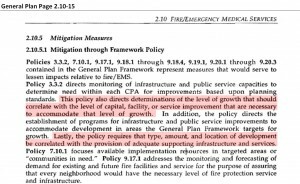 It is clearly linked to how the City promised to use that monitoring and reporting in implementing the required CEQA mitigation created by City known as Policy 3.3.2. 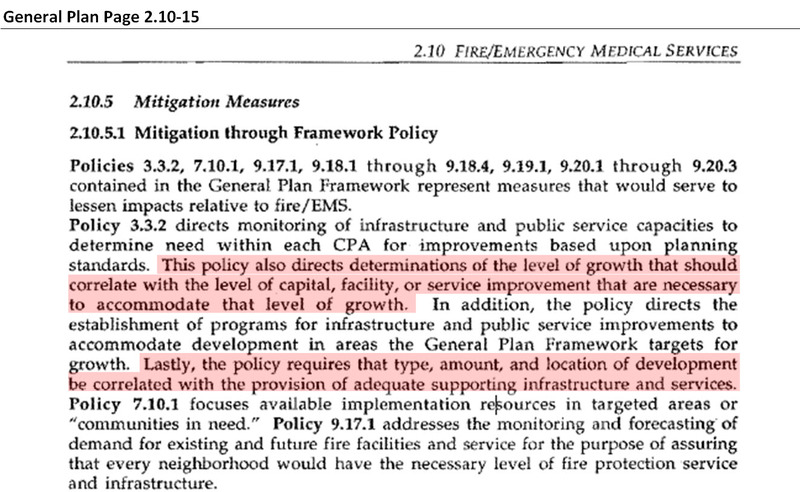 That policy, as stated by the City “requires that type, amount, and location of development be correlated with the provision of adequate supporting infrastructure and services.” If you monitor and report on infrastructure and supporting services and find them lacking, certain inconvenient problems arise. In a time when our firefighters don’t have the necessary manpower to achieve required response times (despite their much-appreciated best efforts), our streets are disintegrating, traffic is crushing, sidewalks are broken, parks are understaffed and we are told each and every day that we are running out of water, Policy 3.3.2 becomes more and more important. If the City continues to ignore its own required monitoring and mitigation policy, we will end up with… An unmitigated disaster. Fix The City would like to thank Judge Goodman for his careful and thorough review of this important issue. http://fixthecity.org/wp-content/uploads/2017/03/FTCTempHeader.jpg 0 0 admin http://fixthecity.org/wp-content/uploads/2017/03/FTCTempHeader.jpg admin2014-07-20 10:24:342014-07-20 10:24:34Judge: HCP Resolution City adopted was "demonstrably arbitrary, capricious and without basis in law"